I was taking the scenic route home from a visit to South Florida and was searching for some Mexican food for lunch. We were in the Wellington/West Palm Beach/Royal Palm Beach area along 441 and wanted to find food before we continued along our route and ventured into the sugar farms. The first two Mexican restaurants that we attempted to try were either no longer in business or closed, so we settled on going to a Mexican chain called On the Border. I had been to an On the Border a very long time ago and didn't remember much. This visit started with chips and salsa. I ordered the three item lunch special where there was a big list of foods and I picked what I wanted. I went with a chicken enchilada, guacamole tostada, and chicken empanada. This lunch ended up being far more food than I was expecting. 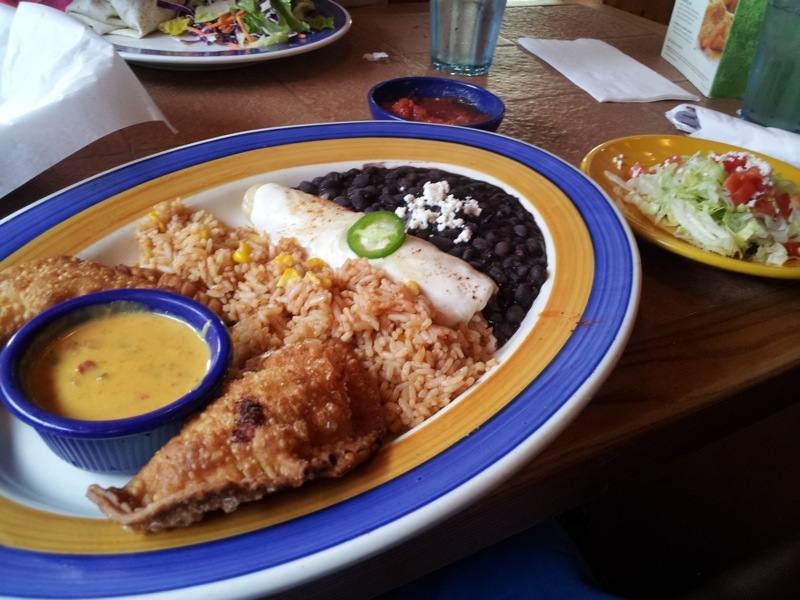 The lunch was served on a huge plate with black beans and rice, enchilada, two empanadas, and a queso dipping sauce. The tostada was served on a separate plate. The food was tasty enough for a Mexican chain with the same parent company as Chili's but the portion size here was a bit of overkill. Half of the food served would have still been a whole lot of food. 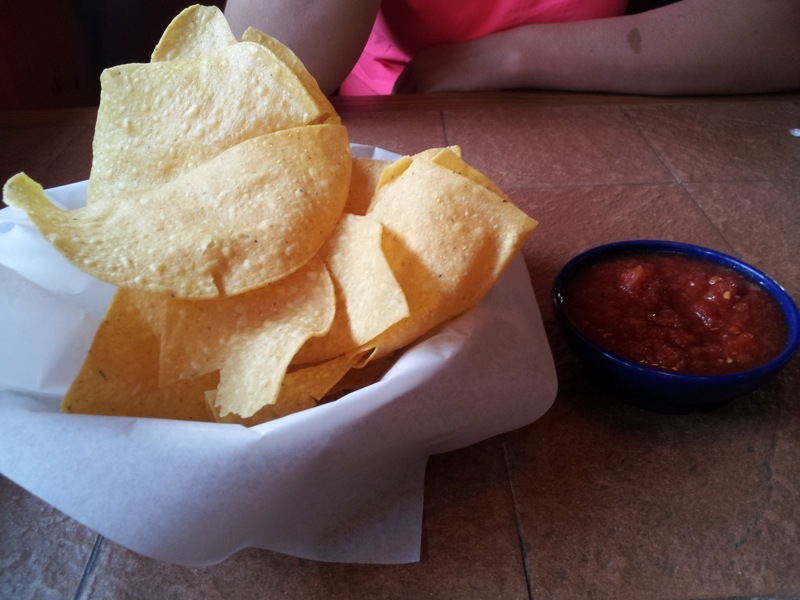 With this being lunch, I wonder how much larger the dinner portions are at On the Border? I had a late breakfast one morning while staying in Boca at a restaurant called Lester's Diner in Coconut Creek. Apparently there are a few Lester's Diners in south Florida although this was the first one I ever came across. The building was unique looking with a somewhat dated looking but cool sign. Looked like it was built in the 1960s or 70s if I had to guess. I ordered the spinach and feta omelet, served with a side of hashed browns and toast. The omelet was tasty with plenty of cheese. The hashed browns and toast were both forgettable. The omelet was a bit expensive for a diner breakfast, about equivalent to the overpriced omelets at a place like IHOP. The big difference here though was that this omelet was way better than what most of the chains serve. I'd return to Lester's Diner. I ventured over to Sea World to see the recently opened Antarctica: Empire of the Penguin section of the park. While there, I had lunch at the new restaurant called Expedition Cafe. The restaurant is very nicely themed as an Antarctic base built into ice. There were three different counters to order from inside. One served Italian food, another served American food, and the counter that we ordered from served Chinese food. Bill & Frank's Brickhouse Grill is a restaurant located in Downtown Deland. I've been here a couple times in the past and always liked the restaurant but never wrote about them on this blog. I took a picture of my food on my most recent visit, so now there's a blog post. The Brickhouse Grill has a very varied menu, ranging from sandwiches, steaks, pastas, salads, and my choice for the evening: barbeque. I decided to try some the beef brisket and smoked turkey. This was served with garlic toast, mashed potatoes, and pickle slices. The meats had a nice smokey flavor. Out of the two, I preferred the turkey. A couple of the slices of brisket were very fatty. It's unfortunate because the brisket was otherwise tasty. The mashed potatoes had bacon and cheese mixed in for some added flavor. My meal at Bill & Frank's Brickhouse Grill wasn't perfect with the fatty brisket, but was otherwise good. I'd most definitely return, next time to probably try some of their sandwiches that sound really good. I was on International Drive and stopped into the Brooklyn Pizza right outside of Magical Midway. Brooklyn Pizza is a local chain with several restaurants around Orlando. I've visited a couple of the other locations a long time ago but they weren't very memorable. Being that this Brooklyn Pizza was in the shadows of go-kart tracks, I didn't exactly have high hopes for the pizza but I was pleasantly surprised. I ordered one of their combos which included two slices and a drink. The two pepperoni slices were good sized. They were nice and thin with a crispy crust. 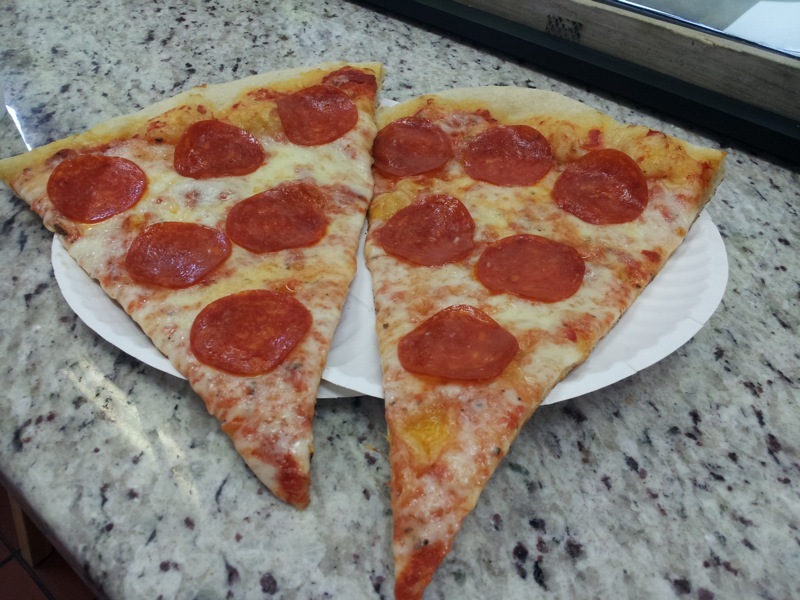 Each was topped with six pepperoni slices. Overall, the pizza was pretty good for pies that I was expecting to be catered towards tourists rather than repeat customers. I'd return. I was in Orange City and stopped to pick up some Chinese take out from a restaurant called China Star. This is apparently a very prevalent name when it comes to these type of restaurants. This particular restaurant was in a somewhat run down looking strip mall located just off 17-92 and I was the only customer at the time. I ordered vegetable lo mein and wonton soup. The lo mein was filled with cabbage, snow peas, carrots, scallions, and broccoli in a tasty brown sauce. 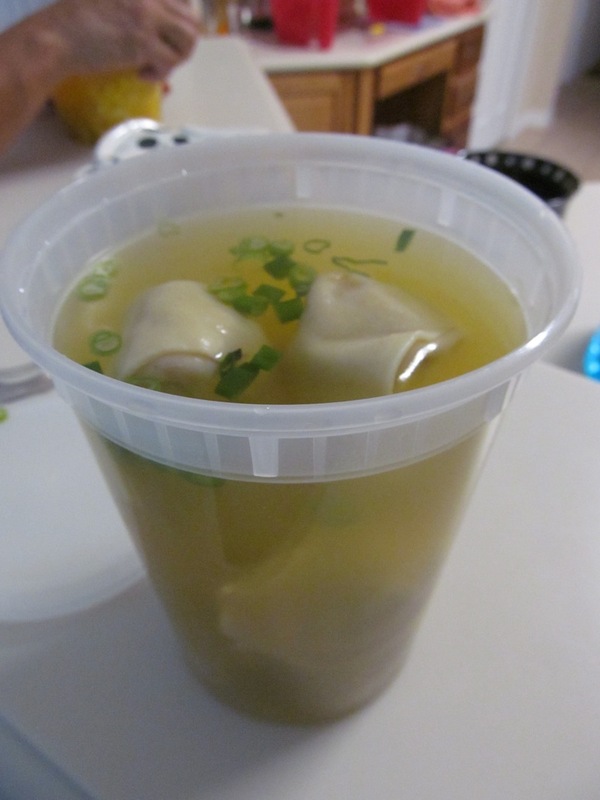 The soup had a nice broth with plenty of dumplings floating around. It had scallions but no pork. For a Chinese take out place, the food that I tried here was pretty tasty. I'd come to China Star again. I was in West Palm Beach and had some dessert at a place called Sloan's Ice Cream. Sloan's was a very colorful place inside. There were intricate ceiling murals. There was a model trolley moving back and forth under the ice cream counter. I apparently missed the main attraction here. Sloan's has one of the top ten bathrooms in the world according to Travel Channel. According to what I read after the fact, the bathroom has glass windows that allow everyone to see in, that is until you lock the door and the windows become opaque. Worth returning for? 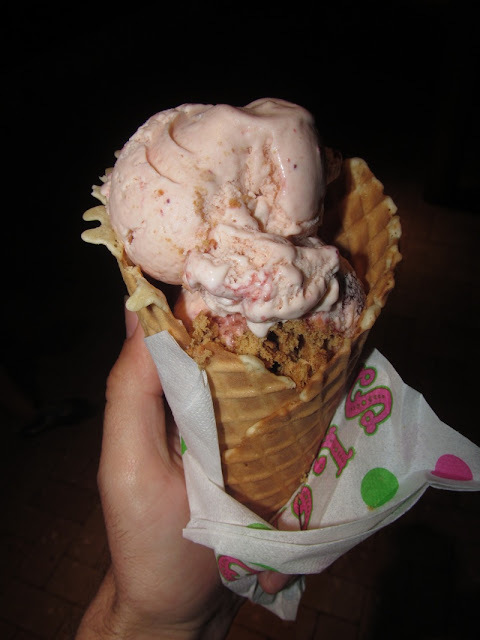 I had strawberry cheesecake ice cream in a waffle cone. The large serving of ice cream had big chunks of actual cheesecake mixed in, always improving any ice cream that calls itself cheesecake flavored. I was in South Beach in Miami and stopped into La Ventana for lunch. This tiny Colombian restaurant was located on Washington Avenue, several blocks away from the bustling and overpriced Lincoln Road. It has been a very long time since I've been to a Colombian restaurant. It fact, I'm actually not sure if I've ever eaten at a Colombian restaurant before. Regardless, I was excited to try some new food. I ordered the Pollo en Salsa Criolla. This large chicken breast was topped with a very tasty, bright orange colored sauce containing lots of sliced onions. Salad, rice, and fried yucca were served as side items. Our server asked if we wanted the spicy sauce on the side, and of course I said yes. Beware of this spicy sauce. Unlike American versions of hot sauce which really aren't all that hot, this Colombian hot sauce was insane and one little spoonful on the chicken was enough for me. Overall, I enjoyed my meal at La Ventana. I'm pretty sure Colombian food was new to me, so hurray for trying the food from a new country and finding out that it was pretty tasty!